Canon’s professional level XA Series camcorder lineup has expanded by three with the announcement of the first cameras in the series with 4K 30p recording capabilities, the Canon XA55, XA50 and XA40. Each of the new cameras features Canon’s 5-Axis Intelligent Optical Image Stabilization, detachable XLR handle, three-inch LCD touch panel screen, tilting high-resolution EVF and in the case of the XA55 alone, a 3G-SDI terminal that supports “camcorder integration into professional workflows”. 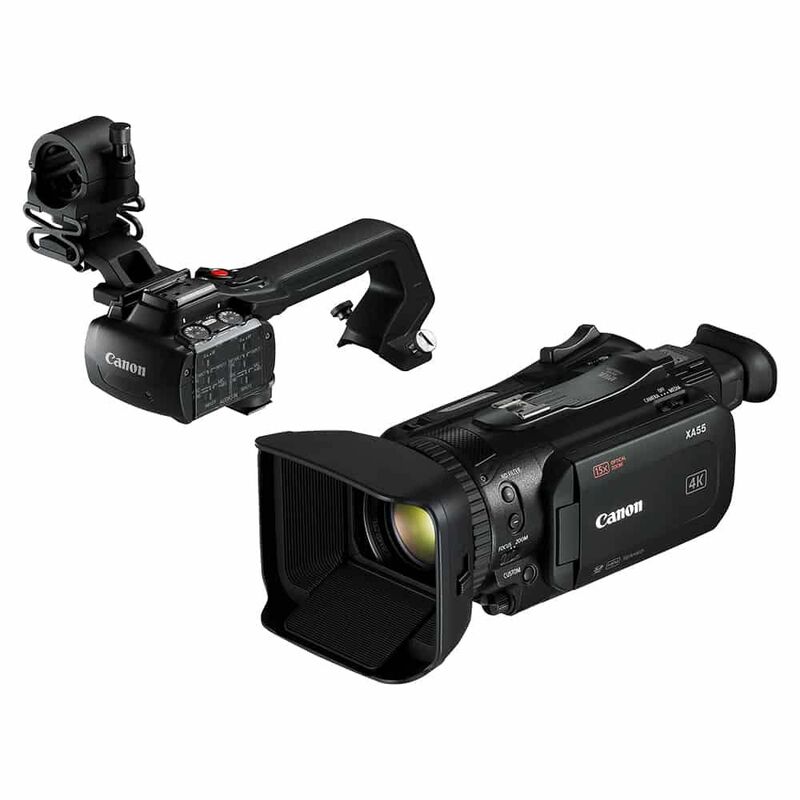 Canon describes the XA55 as “an excellent option for news reporting and documentary shooting”, while the XA50 & XA40 are more geared towards “broadcasting schools, government agencies and corporate-video production companies”. 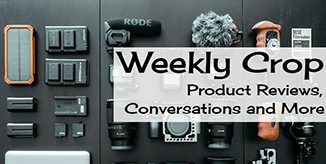 Both cameras are virtually identical to each other and feature a DIGIC DV6 processor, 1.0-inch sensor, Dual-Pixel CMOS AF with Face Detection and Touch Tracking as well as a built-in 25.5mm wide angle 15x optical zoom lens with 5-Axis image stabilization. Another shared feature between the cameras is Wide Dynamic Range (DR) Gamma mode. which Canon says helps achieve a wide dynamic range of 800 percent producing “seamless tone graduations, smooth details, accurate colour and virtually no blown-out highlights” by suppressing overexposure in high-brightness areas of the composition. Both cameras are capable of recording 4K UHD video at 30p, as well as slow motion recording up to 60fps in Full HD (30 fps in 4K UHD) in either XF-AVC or MP4 formats to the dual SD card slots. If you want to record to an external SSD/HDD, both cameras feature an HDMI 2.0 terminal supporting 4K UHD 60p output as well as two independently controllable XLR terminals for audio level control. The XA55 also features a 3G-SDI terminal that provides uncompressed, UHD 1920×1080 25p, YCC 4:2:2 8-bit output or Full HD 1920×1080 50p/25p or 1280×720 50p, YCC 4:2:2 10-bit output with embedded audio and time codes. 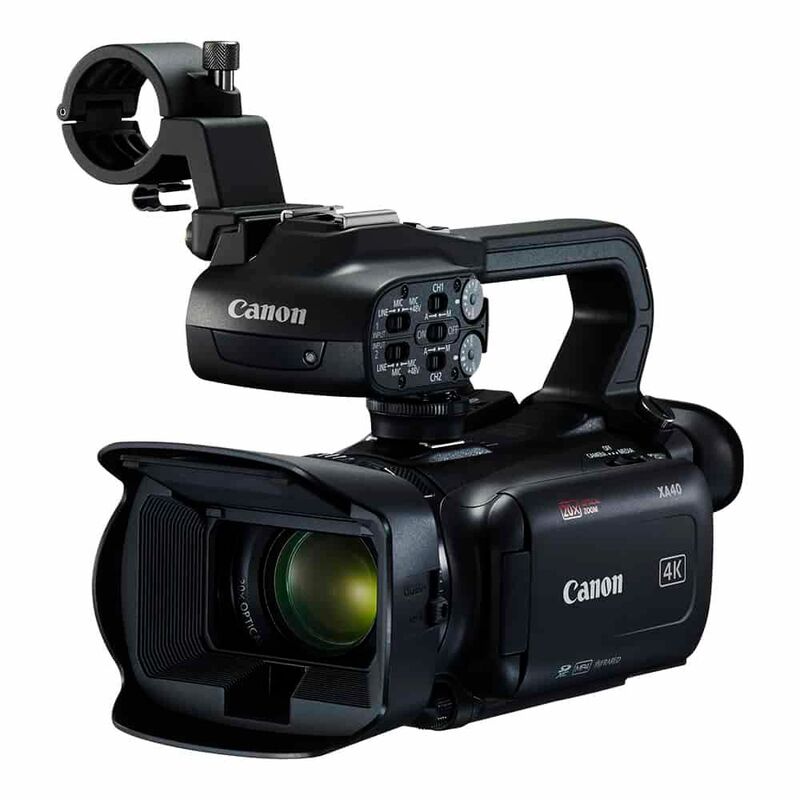 The XA40 is a super compact, lightweight, camcorder with a 1/2.3-inch, 8.29 (effective) Megapixel 4K UHD CMOS sensor, DIGIC DV6 image processor and 20x high definition optical zoom lens. The XA40 features multiple recording modes, resolutions and frame rate options and footage is saved using one or both of the dual SD/SDHC/SDXC supported card slots in 4K UHD and Full HD resolutions in MP4 format only. For added flexibility, the HDMI terminal supports FHD 60p output and can be used to connect a standard external SSD/HDD recorder allowing for conversion to ProRes and DNx formats. The XA40 uses Canon’s Intelligent Optical Stabilization System with Dynamic IS, Macro IS, Powered IS (auto mode). The focusing system offers hybrid AF (w/ instant AF or medium AF), normal AF, face only AF and of course manual AF options. If you want to shoot with full manual control, you can assign specific functions using the custom key and dial feature. Other manual features include, Level & Grid markers, gain control and power zoom with three modes, Fast, Normal and Slow. The XA40 boasts a built-in stereo (16-bit PCM format at 48 kHz) microphone and two XLR audio ports with +48v phantom power are available on the detachable handle unit to support supplemental microphones. Both the built-in mic and XLR inputs can be used separately or simultaneously depending on your needs. Both systems have options for automatic or full manual gain control. For extreme low-light situations, the XA40 features an Infrared Mode which provides approximately 1.4 times more light sensitivity by removing the infrared cutoff filter from the optical path and using a specially designed lens coating that allows infrared light to pass through to the sensor. It also features an infrared emitter with a diffuser located on the detachable handle that allows footage to be captured even in complete darkness.